Followed by a forum conversation with the Artists. Audiences can expect a colourful and emotional journey of the curiosity, love, and at times animosity of being exposed to each other’s different cultures and how they as individuals, and as a group fit into what is usually referred to as Western society. Immigrant Lessons is the soul child of the collaborative efforts of Kevin Fraser and Alyssa Amarshi, two professionals dance artists that have decided to merge their 13 years of combined experience to tackle issues that have been prominent both in their professional and personal lives. Individually, their work has explored issues of sexual orientation and gender identity, feminism, racial discrimination, cultural erasure, intersectionality, as well as mental illness. 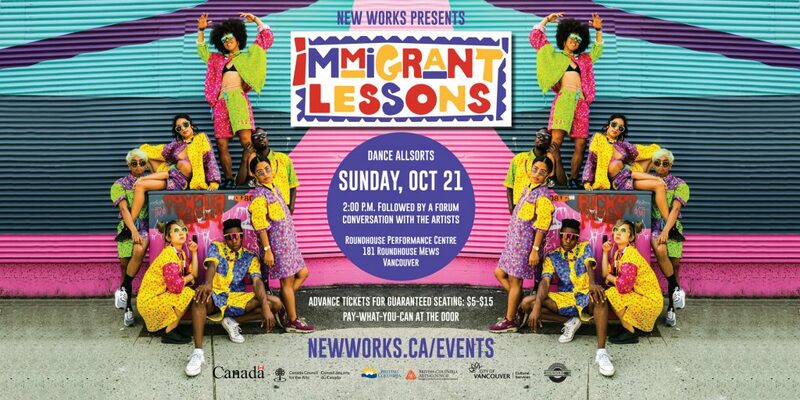 Immigrant Lessons is a combined front to aid in the creation of more opportunities in dance, stage performance, film, urban performance, concert dance, as well as community development for POC and other marginalized communities. Photo: Kimberly Gonzalez and Han Pham. Clothing design: Pattern Nation.